It has been five years since Apple and the dearly departed Steve Jobs introduced us to arguably one of the more revolutionary devices ever, the iPhone. And as Tomi T. Ahonen put it, the history of mobile industry will always be divided into two eras — before the iPhone era and after the iPhone era. The “after iPhone” years have seen the landscape of the mobile industry redrawn and reconfigured. The cash-cows of yesteryears — Motorola, Ericsson, Nokia, Palm and Blackberry — have started to fade into the horizon. New powerhouses like Samsung have surged. The fifth anniversary of the iPhone took me down the memory lane. My first introduction to the world of mobiles was that as a young reporter in the 1990s. It was then I got to spend a lot of time with folks from companies such as Qualcomm, Ericsson and Nokia. (Motorola would come later.) It was fun to watch the launch of the original Motorola Startec and see it become a phenomenon. Nokia, Ericsson and others came out with their own phones. And while the whole industry was optimized around charging for voice minutes there was a lot of optimism when it came to the mobile Internet. A lot of people seem to have forgotten the time when mobile operators acquired 3G spectrum licenses by spending like drunk sheikhs in Las Vegas. A long time ago, I remember watching The Saint starring Van Kilmer, who was standing in the middle of Red Square, Moscow and using his Nokia Communicator doing clandestine banking. I think that scene had such an indelible impact on me that I became a believer in the mobile Internet and small pocket-sized computers. I tried every device that came out — Microsoft WinCE devices, Blackberries. And eventually when I got the Nokia Communicator and some early versions of Nokia smartphones phones, I was hooked. I loved the ability to check email, surf the web, check ESPN scores from wherever I was. I knew it was going to be the story. When I joined Business 2.0 in March 2003, I tried to convince my editors that he should let me work on a story about the coming era of mobile computing. They were not buying into what I was selling. But I kept haranguing them and wore them down and eventually ended up writing the story, I wanted to write. After mucking around with phones and hearing enough experts talk, I had come to a somewhat simple and very obvious conclusion — without wires, our productivity and entertainment options would not be hindered by location and space. Just as the wheel made it easy for society to become more mobile, the elimination of wires would redefine time and location. Of course, the mobile services and devices had to become really cheap in order to cause societal change. And because we could call anyone from anywhere (okay, I was being over-optimistic), mobile phones ended up being a vehicle of change. They changed how we communicated (text messaging). They changed social mores. They changed how we dated, how we made excuses to our spouses and better halves. They redefined how we worked and even when we worked. This was a truly transformational technology. All big technological leaps build on the advances that came before them. Watt’s steam engine, for instance, was based on a coal-mining pump designed by the now largely forgotten 18th-century inventor Thomas Newcomen; ultimately it was the combination of the steam engine and that classic of early invention, the wheel, that revolutionized transportation and brought us the industrial age. In the case of the fifth wave, the springboards are a set of familiar but, historically speaking, relatively new technologies that now have matured enough and found a large enough audience to create a wholly new tech terrain…..wave puts computing everywhere. It offers access to limitless amounts of information, services, and entertainment. All the time. Everywhere….. When I was working on that story, the browsers, location and other sensors were not fully evolved, though if you talked to enough chip makers, you knew where the industry would end up. Nokia was selling millions of N-Series and E-Series phone and was the king of the smartphones. The problem was that they were all still phones – engineered around the idea of phone calls and text messages, two major revenue streams for the phone companies. Established players had no interest in ending the status quo. The phones, despite being so personal, had the personality of steel and stone. They were inanimate. It was clear that someone who was not beholden to the ecosystem would have to rewrite the rules of the game for the Internet to move forward. And that someone turned out to be Apple. Everything changed when I saw the iPhone for the first time. 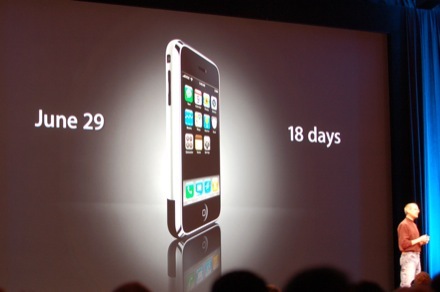 That was five years ago today when Steve Jobs and Apple released their mobile intentions. It was as if he took the mobile business by the scruff of its neck and shoved it into a time machine and forced it to a brand new future. Apple showed everyone a new way of thinking mobile. To be honest, it wasn’t that what Apple showed off hadn’t been tried before. Many of the technologies they used had existed and were used in several of the high-end smartphones, especially those made by Nokia. And yet, it was the entire package was wicked cool. Sure it ran on a slow network. It was a terrible phone and constantly dropped calls. Telecom executives and handset makers dismissed it as a toy. Others thought that the lack of a keyboard was a non-starter. The touch-ability is what prompts people to use the phone again and again. And in the process, it transforms our relationship with the network. Corporations that eschewed Wi-Fi now can’t seem to get enough of it. Telecoms that mocked Wi-Fi are setting up hot-spots so that we can get Internet everywhere we go. Why? “The iPhone is doing to the mobile world, what the browser did to the wireline world,” networking gear maker Juniper Networks founder Pradeep Sindhu told me in an interview. Most of us want “to consume information and information services anytime, anywhere, with no limitations, and preferably in the same way across all devices,” Sindhu said. Today, we don’t think much of calling up an app and ordering a car service, getting take-out dinner, making a video call to our mothers, or simply staying connected to our office. Snapping pictures, checking Twitter, recording how much we have walked or the level of our blood sugar are just routine things we do. We stand at the bus stop and turn the iPhone into our morning newspaper. At lunch, it becomes a recommendation engine. It changes as we change. It adapts as we adapt. It just is us. The ironic part is that today’s iPhone packs more sensors that mimic more human senses. And we don’t know how to put those sensors to good use. Even five years after the launch of the iPhone, it seems we have have just started. I can’t wait to see what comes next. Om, I discovered you when I was watching a N-series presentation that you took over from the host. Your personality was just too big for those guys. I remember you telling them that you were excited to see what Apple would come out with. Do you remember this? Damn, you are bringing back memories now. I still love Nokia – well I did till they started totally screwing it all up. I think MeeGo was the way for them to go. Oh well. Only if you can afford it. For many of us, the smartphone will remain out of reach until service prices get lower. That many never happen. Indeed, its amazing that a derivative of Unix and NeXTSTEP is running the iPhone. What’s really cool is that Tim Berners-Lee designed the world’s first web app on a NeXT Cube! I knew you’d have a great article on this, Om. Miss you! When I went to get my iPhone, I knew the color and size I wanted. Being an informed consumer, I’d done my research, and it was a no-brainer. In my case (and I’ve heard of others), the Verizon customer service reps tried to convince me that I wanted something on the 4G network, and while I’m sure that came from corporate, my life has been changed for the better. Happy Birthday iPhone, and Steve Jobs, the world is a less magical place without you. I wrote to Steve sometime just after OS X launched, saying that a mobile version of the OS would be great for one reason â€” NextStep development tools. The entire mobile industry was driven by the telecoms, only one of which seemed to get it â€” DoCoMo. The US was a mobile wasteland as people like Russell Beattie described. My life under Apple has been tortured, since they would not allow some of our technology. But, there is really no other world yet. My iPhone 1.0 is still in my closet. I now design mobile e-commerce apps, and cannot complain about salary. All was not lost. I thought Android would catch up by the summer of 2009. I thought that Google would be the first with more sophisticated voice search. This much I believe, the next phase is going to be a highly person interface. Even Apple is at risk if something interesting emerges, outside of Android. And, the cloud is going to be mobile. Whoever wins there, wins most of everything. This is why I donâ€™t believe Samsung to be a real threat.